"And they're off!" My grandpa would begin one of his classic jokes. In the fast-paced clip of a horse race announcer, he continued, "It's cabbage by a head, carrot in a bunch. Toothpaste being squeezed out on the rail. "And Diaper, bringing up the rear!" That last sentence always came with a special gravitas. It was a perennial favorite. We would ask him to tell it to us again and again. Recalling it now, I can still clearly hear his voice. Those familiar words came back to me yesterday. The day after Halloween, and the holiday season is upon us. So often it feels like the gates opening with the crack of a starting pistol as we bear, full speed ahead, towards the Thanksgiving and Christmas. Part of the joy of the holidays is the sense of anticipation they create. Sharing them today fulfills some of my own anticipation. 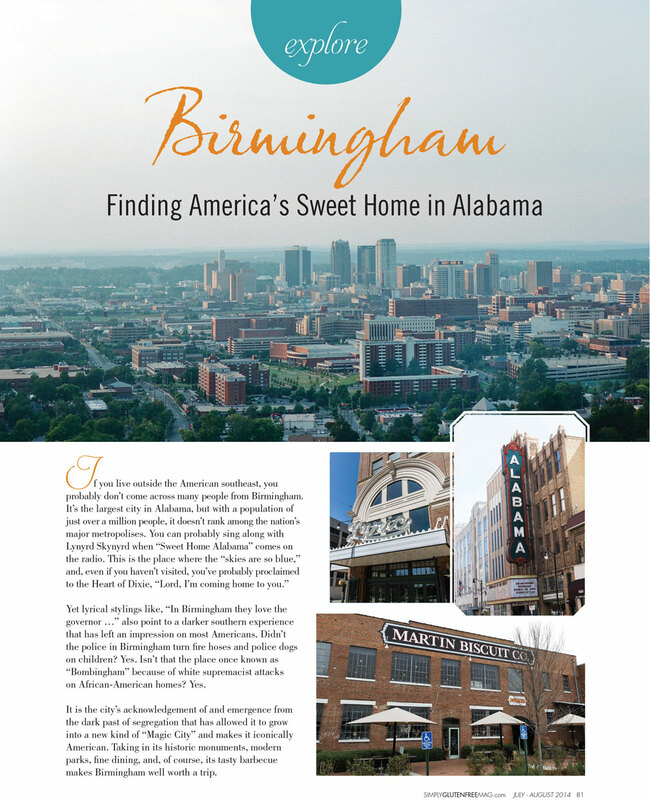 After testing pie crusts and sampling fillings, those recipes are now displayed on magazine racks around the country, and I finally get to share the tear sheets. I think the images are among the best that Stephen and I have worked on together. I hope you enjoy this visual taste of the holiday sweets to come. For the recipes, get your copy of Simply Gluten-Free. My great grandmother Virginia Goettl sat at the kitchen table of my parents' Denver apartment when someone started the tape recorder. "I was born in 1906 in Europe," she began. "I was a year old when I—"
My grandma, Virginia's daughter Betty, cut in. "Whereabouts in Europe, mom?" "I was born in Bosnia... Bosnia was a province of Austria-Hungary that they recaptured from the Turks in the early 1800s," she explained after my hearing-impaired grandpa mistakenly thought she said Boston. It was a quiet family evening in August 1982. My parents were there (my mom was seven months pregnant with me) with my grandparents and my dad's cousin Julie. You can hear the sound of plates being cleared in the background as my dad and grandma set out to capture Virginia's story. "Okay, what we wanted to record mostly was about history, about family history..." Betty starts to explain at the beginning of the tape. Earlier this year, I borrowed the three tapes they created, and started what I've come to call the "Family History Project." My great grandparents had a life of unplanned adventure after my great grandpa John was diagnosed with tuberculosis in 1929. Their story is beyond the scope of a single blog post. Those tapes, though, and some of the simple and straightforward statements that emerged from them have shed unexpected light on questions I've had about my family history. Since my first family recipes post about kiffels, I've wondered why my "German" family prepared so much Hungarian food. We have a cookbook of different family recipes that my aunt collected for a reunion in 1999. All of the ones attributed to Virginia indicate a strong eastern European influence. And it's not just hers, but several of her relatives' recipes for goulash and paprikash, as well as my mom's kiffels, all point to a past situated well outside the borders I grew up associating with my family. I don't have all the answers for why my family continually talked about their strong German roots yet were actually located in the southeastern territories of Austria-Hungary. But the straightforward sentence, "I was born in Bosnia," explains why I grew up with the hearty and comforting flavors of foods infused with Hungarian paprika. It made me excited to try a recipe for "Real Hungarian Goulash," that my Aunt BJ submitted, explaining that her Aunt Helene Kailer made the stew for her after her first son was born. Preparing the simple, tomato-based beef stew connected me to a part of my family's past that I now perceive more clearly. I will continue exploring the various facets involved in my Family History Project, examining how a disease led the Goettls from Ohio, through the Deep South, and eventually landed them in Phoenix, Arizona. I can see that path laid out in the food we love, and the recipes we've shared with one another. So, we'll start at the beginning, with the Hungarian food that I grew up believing was German. Here is Aunt Helene's goulash. And, as my mom was careful to instruct me, be sure to get the Hungarian paprika in the red tin! It's the best. 1. In a dutch oven or stock pot, heat oil to low. Add chopped onion and cook slowly until onions are transparent (about 15 minutes). 2. Add red bell pepper and continue to sauté until tender (5-10 more minutes), stirring regularly. 3. Cover the onions and peppers with the stew meat, and allow meat to brown. 4. Stir in paprika and tomato paste, and then add enough water to cover the meat. Add carrots (if desired). Cover and let cook over low to medium-low heat for 1 1/2 hours, uncovering the pot for the last 30 minutes so that the stew thickens slightly. 5. Serve over noodles, and garnish with parsley. A warm and crispy hash brown potato shell filled with cheese, eggs, and sausage. In my family, this particular breakfast was a staple of potluck brunches, family gatherings, and, most memorably, Christmas morning. It’s easy—spread the hash browns in a pie plate, layer in sausage and cheese, and then pour in a few whisked eggs on top. The result is an appetite-inducing, eye-pleasing addition to the breakfast table. When Simply Gluten-Free Magazine asked us to work on a brunch menu for the March/April issue, this breakfast casserole was one of the first recipes I thought to include. A few phone calls to mom, and I had the details of the recipe sorted. It became my favorite part of a story on hearty brunch dishes that I ended up developing, which also included a potato medley hash and a creamy grits bar (a nod to my adopted home in the South). Working on these recipes gave me a chance to write about one of my favorite ways to share breakfast: a gathering of fellow soccer fans on a Saturday morning to watch English Premier League soccer and cheer on our favorite team, Chelsea FC (Go Blues!). The breakfast casserole had the most personal significance to me. Like Mom’s Chicken Soup, it conjures up happy memories. This time, it's Christmas morning and I can instantly see mom behind the stove in the little kitchen of our house in Longmont, Colorado, pouring the egg mixture into the pie plate just before popping it into the oven. Those memories make it a favorite family recipe. It’s also a recipe for classic comfort food. This recipe is durable, satiating, and delicious. And it’s versatile. It will always be a crowd pleasure with breakfast sausage and cheddar, but swap in swiss and use turkey sausage or even ham and it will be equally tasty. For a healthier option, one could do egg whites and toss in some chopped kale or spinach, or make it vegetarian by eliminating the meat entirely. It’s the perfect recipe for the cook who loves to experiment. A few ingredients, simple instructions, and a world of possibilities—I’m increasingly convinced those are the elements behind a family favorite that just about anyone can enjoy. Breakfast casserole that I food and prop styled for Simply Gluten-Free Magazine. Photo by Stephen DeVries. Heat olive oil in a large skillet over medium heat, and brown hash brown, flipping them once (about 3 minutes on each side). Mold hash browns into a 9-inch pie plate. Layer turkey sausage on top of the potatoes, then add the shredded cheese. In a separate bowl, mix together the eggs, half & half, salt, and pepper. Pour mixture over cheese layer. Note: The hash browns do not need to be fully cooked before placing them in the pie plate, and slightly undercooked potatoes will make for a firmer casserole crust. Growing up, I counted my grandma among my biggest heroes. She always had things for us to do, and new adventures to embark upon. From homemade fetticini noodles, to little water color painting sets and embroidering lessons, to kitchen-sink science experiments—everything we did had a little lesson to be learned, a nugget of knowledge to take away. I can see so much of who I've become in the natural curiosity she helped cultivate in me. Grandma "running eggs" at their chicken farm in Colorado. She was nothing if not a hard and dedicated worker. Was our celebration of George Washington's birthday a little silly? Perhaps. I suppose the whole idea was birthed out of trips to Colonial Williamsburg, and a shared love for history among my parents and grandparents. As a kid, it was full of imaginative possibilities. No wonder I went on to pursue history full-time. The best part was that grandma never broke character. There was no cynicism in her recreation, no laughing at herself, only a little flair for the dramatic. It lent gravitas to the scene, and made it that much more realistic and significant to everyone else. 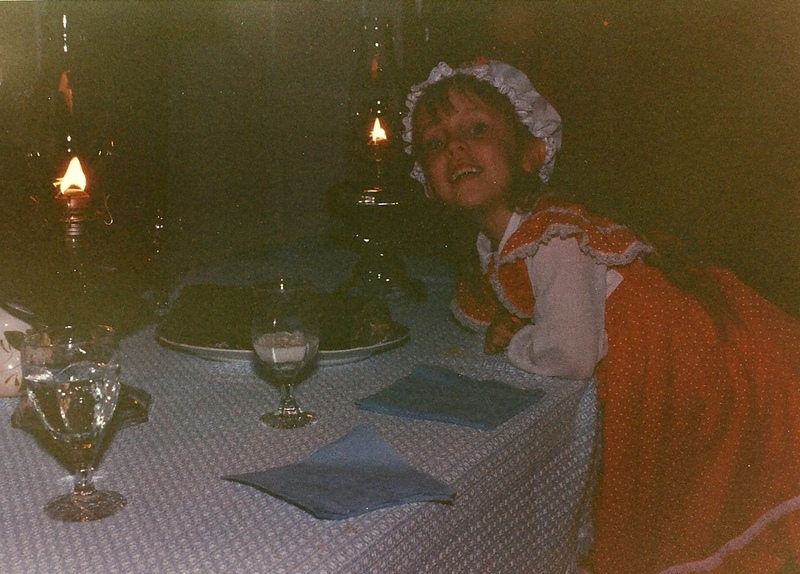 A young me, proudly posing before our dimly-lit colonial dinner table. Apparently, they pulled out all the stops in George Washington's day with blue paper napkins. The memories of George Washington's birthday came back to me while making my mom's chicken soup the other day. Since my immediate family no longer lives in Colorado, and my grandparents' farm—the setting for the birthday festivities—was sold 20 years ago, food has become an important link to fond memories of the past. As I smelled the soup on the stove, I thought, "It smells like home." Not our physical house, but the feeling of being at home. If the smell of home exists, for me, it is made-from-scratch chicken soup. I don't remember exactly what we ate during the birthday. Considering grandpa's sweet tooth, I have no doubt that a historically inaccurate cake was involved, probably of the chocolate variety. Whatever else was on the table, I'm sure it was hearty, warm, and satisfying—like my mom's soup. So in honor of George Washington's upcoming birthday, and the precious memories I have attached to it, I thought I'd share mom's soup recipe. It cooks slowly, as good things do. Hopefully it will warm your heart the same way it continues to warm mine. Heat oil in the bottom of a large stock pot over medium heat. Add chopped onion, and stir regularly until onion is clear — about 2 minutes. Add the whole chicken (including the skin and bones) to the pot, and add enough water to cover. After water begins to boil, reduce heat to a simmer with cover slightly ajar for 2-3 hours, or until chicken is completely cooked and the meat is coming off of the bone. Turn stove back to medium heat, and return strained broth to the stock pot. While allowing the chicken to cool slightly, chop the carrots and celery and add them to the broth. Skin and debone the chicken. Then return the meat to the stock pot. Add rice, and allow the pot to simmer for 45 minutes, stirring occasionally. Add salt and pepper to taste, and/or a chicken bouillon to enhance the flavor. Top with chopped parsley before serving. Allowing the chicken to cool slightly before deboning eases the process, and makes the fatty tissue and bones much easier to remove — it will also keeps you from scorching your fingertips. This soup freezes well, and makes great leftovers. My mom always said the second bowl was the best. If you're looking for a little extra kick, throw in some hot sauce for added spice. Trust me, it's delicious. My Twitter feed is an eclectic hodgepodge. There will be 140 characters worth of organizing ideas from Real Simple, followed by a thoughtful question about women and faith from Rachel Held Evans, and then there's the Arabic-language update with news from Cairo. In a way, it's evidence of the many directions my life has taken in the last four years. And as Twitter reminded me a few days ago, I just passed my four-year "Twitterversary." Stephen while stuck on an icy Hwy 280 for four hours. Late-January is full of odd anniversaries for me. Yesterday, Facebook was abuzz with recollections of the South's Snowmageddon from a year before. People across the region were hit by a surprise snow and ice storm that left them either stuck in their cars or abandoning them and walking home. Kids and teachers couldn't leave school. I had the good fortune of only making a four-hour round trip drive to Tuscaloosa, while Stephen's casual drive to Home Depot turned into a 12-hour trek across town that included walking six-miles in the ice. I have not gone a week in the last year without hearing someone regaling their experiences during that storm, or relating my own. But something strange occurred to me during those frozen, snowed-in days last January. They marked three years since I was also stuck at home, but this time for a completely different reason. On January 25, 2011, the Egyptian Revolution started, and like so many other millions, I was there. With tight curfews and no police force, people generally stayed close to home. That's when I joined Twitter. It had become the most effective way to track the news—at least until Mubarak turned off the internet. Three years later, I found myself again feeling simultaneously cut off and exhilarated. Yet in January 2014 I ultimately felt safe and secure, just a little bit cold. In Cairo, things were much less certain, and while I did not feel I was directly in harm's way, our circumstances were defined by a lack of security. Me after evacuating Cairo in early February, and making my way to Cambridge, UK A cozy seat at a warm pub with a good friend was exactly what I needed. Photo by Galina Mardilovich. As people have continued to recount their Snowmageddon experiences for the last year, there has been a cathartic quality to all of it. People were traumatized. And trauma leaves a deep psychological mark. It has to be expunged, and for me and the Southerners around me that meant talking about it. It would have been awkward to bring up in those conversations how privileged we are to be able to talk and laugh about our experiences. To be able to recount our trauma and breath a large sigh of relief with smiles on our face at the end. Not everyone gets to recall their trauma that way. Not everyone gets such quick relief. For those most hopeful in Tahrir Square in 2011, their dreams of democracy and real change have been largely dissolved by a new military dictatorship. It was 50˚F in Birmingham one year after Snowmageddon. It was literally a warm balm on the storm's temporary wounds. At the same time, Egypt's revolution is being recalled with images of the new leadership's most recent victims—Shaima Al-Shabbagh brutal shooting in the midst of a peaceful anniversary protest and the death of at least 18 other people. There is no need to diminish the trauma of last year's storm. But there's a perspective we could take in recalling our own discomfort—one where we realize that we found quick relief where so many others are still waiting. When it comes to holiday traditions, Easter can be confusing. For many Christians the celebration of Christ’s resurrection stands at the heights of the sacred calendar. Yet most of traditional practices — including the name of the holiday — have pagan roots. Where did the word Easter and its bunny come from? Well, that would be a reference to Eostre, the Anglo-Saxon goddess of fertility whose sign was a rabbit. While the Easter table might lack the kind of nostalgic grounding in tradition that one experiences at Thanksgiving and Christmas, I find this freeing. For us, Easter has become a time to create new holiday memories and traditions with our friends. Since it takes a two-hour drive or a four-hour flight to spend the holiday with family, I try to incorporate family by including some traditional family recipes on the menu. For this year, I’ve adopted the traditional Hungarian kiffel (something we usually eat at Christmas) to our celebration of the resurrection. The kiffel combines cream cheese pastry and a touch of jam for a mixture of savory and sweet that’s hard to resist. This also kicks off a series on traditional family recipes that I plan to continue sharing on the blog. I figure, what better way to explore the history of what we eat, than to delve into the foods I associate with my family history? Whenever I eat a kiffel, I think of my dad sneaking a few each time he passed through the kitchen and my mom telling him to save some for the rest of us. It makes them all the more special to think about my grandma and great grandma making them before me. While our families will be celebrating Easter across the country, our little Alabama duo will think of them fondly and enjoy a cookie in their honor. It’s not a bunny or an egg — but who said those had all that much to do with celebrating the resurrection in the first place? Using a fork or pastry cutter, cut in cold butter and cream cheese. Working with your hands add in sour cream and egg yolk so that the dough forms a soft ball. Be careful not over mix the dough — if it has a marbled look, that’s okay. Divide into two balls, wrap each in plastic wrap and refrigerate for at least an hour (can be refrigerated overnight). Working one ball at a time, unwrap roll out on a sheet of parchment paper dusted with tapioca starch. Roll out dough until it is 1/8 inch thick. Cut dough into 2” squares and place a 1/2 tsp. of filling in the center. Fold into triangles or cylinders. *My information on the history of Easter came from Cathy K. Kaufman’s “Easter” entry in The Oxford Encyclopedia of Food and Drink in America (1ed. ), Andrew F. Smith, ed., Oxford and New York: Oxford University Press, 2004. Accessed online at http://www.oxfordreference.com.libdata.lib.ua.edu/view/10.1093/acref/9780195154375.001.0001/acref-9780195154375-e-0280?rskey=iQtsmi&result=7 on 18 Apr. 2014. It sits perched in the health food aisle of the grocery store — bags of flax seed lined up among the organic granola, peanut butter, and other natural, specialty foods. I sprinkle a little of it on my breakfast yogurt nearly every morning. Some even use a combination of flax seed and water to replace eggs when baking. While flax has become a fixture in the modern market for green living, its journey into today’s diets was more laborious and nuanced than one might expect. The original production of flax focused on textiles rather than dietary consumption. Flax is the plant behind linen, and historically its value comes from its fibers, not its seeds. Cultivation of flax for linen was especially prominent in northern Europe, where people in France, Flanders, Germany, and Ireland began cultivating the crop as early as the Bronze Age (2300-500 BC in Europe) and the practice rose to prominence during the medieval period. With St. Patrick’s Day just around the corner, and Stephen and I planning a trip to Ireland for later this month, it seemed appropriate to give a few details on the Irish experience of flax production. For the Irish, linen became especially profitable by the late-seventeenth and eighteenth centuries, by which time the British government began investing in expanding linen production. While traveling in Ireland, Arthur Young, an Englishman, remarked, somewhat condescendingly, on the importance of linen to the Irish economy, commenting, “The only considerable manufacture in Ireland which carries in all its parts the appearance of industry is the linen, and it ought never to be forgotten that this is solely confined to the protestant parts of the kingdom...” Young continued that considering the French example, this was not to say that the Catholics were incapable of such production, but that the Irish Catholics of the south had yet to capitalize on linen in the same way as the northern Irish protestants. Apparently, even the history of flax and linen are riddled with the confessional divisions of Anglo-Irish, Protestant-Catholic rivalry that run throughout Irish history. Young was right in seeing the promise of commercialization in the linen market. By 1810 farmers had sewn 70,000 acres with flax, and that number more than doubled by the 1850s when flax grew on some 175,000 acres. But the mid-nineteenth century also saw blight to potato crops and the devastating Irish Potato Famine, which left a million people dead and saw another 1.5 million emigrate, mostly to the United States. While that traumatic and devastating loss is responsible for the growth of a robust Irish heritage in the U.S., it also marked the decline of the Irish linen industry. The flax seeds — a byproducts of linen production — not only became an eventual ingredient in health food, but the oil derived from pressing the seeds, known as linseed oil, is used in oil paints, varnishes, and linoleum. What does all of this have to do with the Linzer Torte, you might ask. Well not a whole lot, except that the Linzer Torte traditionally uses walnut flour — something that I am allergic to, so I thought I’d try an alternative. I combined almond flour and flax seed meal to arrive at a delicious and hearty crust for my torte. When I started thinking about what laid behind that creation, I decided to explore the history of flax in greater detail. 2 1/2 sticks butter - cold, unsalted, and cubed. Optional: 1 cup slivered almonds. Note: You can make the torte as either a circle or a square. This recipe makes enough for two 9 inch round pans, two 8 inch square pans, or one 9x13 rectangular pan. Because I wanted to cut mine into square bars (as opposed to wedges) I opted for the single 9x13 pan. If you are making a circular torte, it is preferable to use a cake pan with a removable bottom. Stir together the almond flour, flax seed meal, and sugar. In a large bowl stir gluten-free flour, cinnamon, clove, and salt together until well blended. With a fork or pastry blender, work cubes of butter into the almond and flax mixture until it as a course, crumbly texture. Stir in the sugar, almond, and flax seed mixture. In a small dish, beat together the egg, egg yolk, and lemon zest until combined, then stir into almond and flax crumbs. Gently kneed the dough to fully incorporate the egg mixture, and the dough forms into a ball. Divide dough in half if making one torte, or into quarters if making two. Place one portion into the bottom of the pan and use your fingers to press it evenly across the pan and about 1 1/2 inches up the side of the pan. It should be evenly distributed across the bottom of the pan, but does not need to be smooth. Bake the shell or shells for 12 min. While the shell(s) bake, roll out the remaining dough between sheets of wax or parchment paper until it is 1/4 inch thickness, and one inch bigger than the pan. Then place it in the freezer to chill for approx. 20 min. Remove shell(s) from the oven and let cool slightly. I put dry, gluten-free bread in the food processor to create my bread crumbs until it was as fine as possible. Stir jam until it is soft, and spread it across the shell(s). Remove dough from freezer and cut into 1/2 inch wide strips, cutting through the dough and waxed paper. Use the lift the waxed paper, and place the strip, dough side down, onto the filling. My dough was fairly stiff after coming out of the freezer, so I was able to handle it without cutting through the wax paper. Arrange strips on a diagonal about 1/2 inch to 3/4 inch apart, layering them in a criss-cross patterns to make the lattice top. My dough was not pliable enough to weave into a traditional lattice, but layering them on the diagonal still created a nice, diamond-shaped effect. Use leftover pieces to fill in any gaps. Mix egg yolk with water and brush all of the lattice and border. Sprinkle with slivered almonds, if desired. Bake torte for 45 to 60 minutes. Remove from oven and place on rack. For best flavor leave the torte or tortes stand uncovered overnight before serving. Note: I adapted my recipe from one posted last December on Smitten Kitchen. If you are looking for a traditional recipe that uses walnuts, I would recommend following her example. *Earlier this month I had the opportunity to share my experience of being diagnosed with celiac and going gluten free with fresh style magazine. I shared a recipe for chocolate chip cookies, and my go-to gluten-free flour blend on the magazine's blog, You can download a printable version of the recipe for the cookies and the flour blend here. Information on the history of flax and linen came from The Oxford Dictionary of the Middle Ages, and The Oxford Companion to Irish History. For those especially curious, you can read all of Arthur Young's eighteenth century observations about Ireland on Google Play.